A few years ago I located a couple of carpenters who spoke enough English (and were pretty good at sign-language) to readily understand what I wanted them to create. A few weeks later they contacted me, “het is klaar” (it’s ready). My concept: I wanted to create a two sided painting (on a wooden panel) with a rotating inner core. The core needed to be extractable duing my creation process but afterwards could be fixed (permanently) in place. But why create two paintings on one panel? It’s a ton of work. And what would be the reward? That’s very hard to say, except this: it’s a clear and definite way to demonstrate relation. Relation of what to what? You choose, but of course it offered the fundamental and very pregnant possibility of contrasting realism with abstraction in a direct and visceral way. For one side, I chose a landscape. 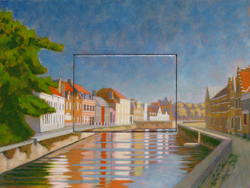 A realistic, almost academic landscape based upon a value study of one of my favorite views of the Predijkherrenrij here in Bruges, Belgium. And for the other side? 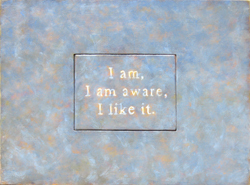 Initially, and for a long time, I planned on an open blue field containing a text from Nisargadatta Maharaj, “I am, I am aware, I like it.” My thinking was simply this: if you have to use words to convery your intent, then these words from Maharaj summarize just about all that you ever really need to know. So, that’s what I created. When the inner core was rotated into “reality” I got this revised version as seen here left and right. Double ahhhhhhh……. Mucho bueno. I recently completed the translation of a piece of text based upon the drig-drishya-viveka from the Indian Advaita Vedanta tradition. The thrust of that classical text is that the fundamental unity of being-awareness, previous to all conditions, is discovered by continually stepping backwards through each level of phenomenal conditioning to always discover the unifying quality of being-awareness on the preceding level. Its non-dual premise got me thinking about painting – and all the arts for that matter – as experiential examples of that unitive quality of consciousness manifesting itself through transparent action on varying levels of material existence. To flesh that statement out, I can try to clarify what I now understand to be a main aesthetic principle. What makes a piece of art – art – is its own vibrant inner unity as the expression of an idea, feeling, sensation, movement or combination thereof. It’s not about – and never has been – a good, even excellent, depiction of some external reality. But rather it is about the consciousness-unity of the artist (subject) merging with his or her materials and subject matter (object) in such a way so as to reflect back a little piece of cohesive life to the consciousness-unity of his or her viewers. When it’s good, it’s magical. As viewer, or listener, we enter into the world of the artist, we recognize some aspect of ourselves and are transformed by the experience. Additionally, and at this point in humanity’s knowledge of itself, it’s certainly not required that the final form of a piece of artwork be classically realistic. Most contemporary artists prefer at least some level of abstraction. But modality aside, what makes a work of art eloquent is the unity of the intent expressed through the materials on into the final form. “Perfect”, we say, form = function, function = form, in an aesthetic sense. The only rule is that a piece of art must be true to itself, whatever that self is. Looking at artistic creation from this point of view frees both the artist and his or her audience from any formal constraint, allowing modality, medium and message to merge by simply remaining true to the original impulse. I’d guess that most artists in their creative act intend to hint at what they experience as ineffable. If they could say what they wanted to say with words, they would do it, but shapes and images, music or dance often speak more eloquently to and from a level that is non-verbal. For the artist, in the visceral interplay between sensation, perception and action, a creative discipline is chosen which resonates with their sensibilities, whatever they may be. Additionally, to the extent that artistic expression can be seen as a response to the interaction of self and world, that response must be recognized as arising from the entire gamut of human experience. So there is a response of and to the self/world experience of waking state consciousness, dream state consciousness and deep sleep or meditative consciousness. Artists who attempt to explore and express their response to these different dimensions of human experience find themselves choosing a visual vocabulary which resonates accordingly, be it realistic, symbolic or abstract. Thus, at least within the visual arts, there seems to be a relationship between the experience of self-world and the choice of a particular creative modality. What is that relationship? Let’s take a look. Realism offers the artist a visual vocabulary for exploring the objects which daily present themselves to the senses within the waking state of consciousness. It’s an exploration and discovery of the phenomenal world surrounding an individual who essentially considers himself/herself as separate from these external objects or forces. For most people in the Western world, the contents of the waking state of consciousness constitutes their sense of “reality”. When realism is most successful, the artist is able to both intensely experience and viscerally convey a sense of inner unity with these external objects or forces, thereby offering others a chance to experience their own reality in an enhanced way. Take, for example, the high level of realism in a powerful work by Da Vinci, Rembrandt or even Van Gogh. A recognizable external reality is certainly depicted, but it’s charged with an inner unity, often radiating with great intensity. Much of the history of Western art – at least previous to the twentieth century – has spoken this language. Psychologically speaking, such work can reflect a personality in varying modes of relationship to the surrounding phenomenal world, a world furnished with the forms perceived within the waking state of consciousness. Its realistic depictions can range from polished, to symbolic, to naïvely abstract: the best works containing a mixture of all three. In contrast, symbolism as a methodology offers the artist carte blanche for the exploration of his or her own dream-world consciousness. 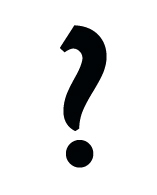 Graphically speaking, there is usually a simplification or reduction of external objects to their inner essence. For the artist, it’s a rediscovery and expression of personally significant images or forces arising from within their own consciousness. The symbolist then, no longer sees themselves as completely distinct and separate from the formerly external objects of waking consciousness, but rather understands themselves to both contain and manipulate – or even be manipulated by – these projections. The artist’s sense of self expands through exploration of this dimension, just as humanity’s knowledge of itself also expands through a recognition of archetypal myths and characters. This expansion carries with it a sense of inner veracity, a greater self knowledge, a knowledge that includes and expands upon the reality of the waking state. 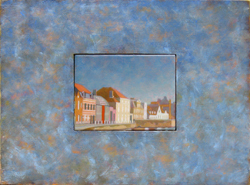 Thus, when this mode of creative expression is most successful, the artist is able to recognize this level of being-experience within themselves and viscerally convey its (often archetypal) contents to others, offering the viewer a chance to perceive themselves and so their own reality in a newly expanded way. Consider, for example, the mythic gods and heroes of Jung’s Red Book, the dream world of lucid imagination à la Odilon Redon, the powerful haunting entities of Dali’s surrealistic almost shamanistic inner journeys, or Picasso’s African masks. These are powerful images evoking associations to sub-conscious human experience-memory. Psychologically speaking, such imagery resonates on the level of the unconscious mind – both individual and collective. 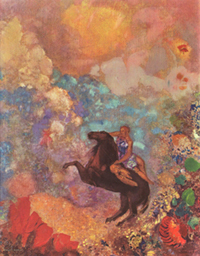 The end of the nineteenth and the first half of the twentieth century, in particular, celebrated this new kind of visual vocabulary in Cubism, Fauvism, Symbolism, Primitivism, Surrealism and Expressionism, although, of course, the art of indigenous cultures has always contained such imagery. Contrary to the two previous modes, abstraction opens the doorway towards that realm of being-experience which extends far beyond the sphere of a separately existing person within the world of external forms. The artist uses this mode as an attempt to get to the absolute essence of experiential forms by questioning his or hers (and so also the viewer’s) own sense of reality. It delves into the expansively open space of the deep sleep or meditative consciousness where no “person” exists. For subject matter, there is none, not really, but rather the structures of perception and/or the medium itself are explored or examined in an open, intimate and often playful manner. When it’s successful, the artist is able to recognize this level of being-experience within themselves and reflect back its lack of phenomenal content with an economy of means. Perhaps that is why abstraction as a form is both so difficult yet sublime, so condensed yet expansive, so negating yet fulfilling – and ultimately so unapproachable by the rational mind. With Abstract Expressionism, Color Field, Minimalism, Hard Edge, Lyrical Abstraction, the demolition of graphically meaningful forms moved even further towards abstraction in the latter half of the twentieth century. The artist’s intent focused on a visual vocabulary speaking for and to the ineffable non-phenomenal world, always, already present within a human being, and assumed that by avoiding representational elements altogether, the artist could more effectively suggest the sub-symbolic level of being-existence. 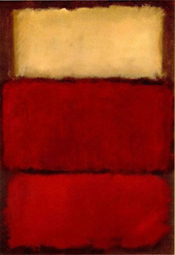 There have been a number of artists visually evoking this level, Mark Rothko being one of my own personal favorites. Pure abstraction, then, as a psychological projection of no-self portraiture, transcends traditional Western psychology and moves into the trans-personal spiritual world of Yoga psychology. This expansion carries with it the potentiality of ever greater inner veracity, ever greater self knowledge, a knowledge which precedes and so both includes and expands upon the realities of the dream and waking states of consciousness. It is exemplified by the deep, dreamless sleep state of consciousness (turiya) or the deep, peaceful calm of a meditative state. An alternate way to approach (a non-dual) understanding of creativity is through exploring the subject/subject matter/medium dialectic of creative expression. We can take the creative act as a dialectical exchange of these three existential entities. Accordingly, the subject matter of what an artist creates is often an intimate projection of their own self-image, whatever form that image may take at any particular time. Who am I? is expressed on different levels of being-experience. Through the projective objectification of some aspect of themselves the artist turns around and says “Yes, that’s me”. Yet simultaneously, through that same act of creative objectification, it’s also abundantly clear “No, of course, that’s not me”. A similar dialectic of self inquiry is documented within the drig-drishya-viveka: recognizing, aligning with, then finally negating, any particular objectified aspect of self-perception by affirming the pre-existing nature of the unifying awareness which perceives it. Accordingly, the realistic painter feels themselves especially drawn to particular people, landscapes or objects and uses his or her tools to both explore and express the sense of intimacy or lack of separation he or she feels for these external forms. This self-projection tends to move towards symbolism when, through insight, the inner significance of these external forms becomes recognized. 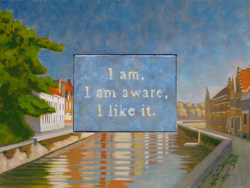 Then the subtler symbolic meanings acquire a stronger sense of reality than the external forms themselves, both including and expanding the artist’s (as well as the viewer’s) sense of self. This process progresses as the artist attempts to discover the absolute essence of external forms and in so doing digs ever deeper into themselves, experiencing the accompanying sense of inner veracity like a guidepost. This probing has a tendency to lead towards abstraction. When mind pursues this direction to its logical aesthetic conclusion it pronounces, “Form is dead”. How true. But what has actually happened is only this: mind has discovered its own limits, just as, through self inquiry the limiting constrictions of the “person” become fully recognized, allowing these relative structures to finally dissolve and die. Form is dead, but the one who recognizes that fact cannot be. Similarly, within artistic activity, the irreducible effervescence of creativity itself does not die and it never will. Experience tells us so. The final answer is this: nothing is. All is a momentary appearance in the field of the universal consciousness. Continuity as name and form is a mental formation only, easy to dispel. Ah ha! The ultimate discovery, in art, as in life, there is no absolute object which can be pointed to, no thing which can be specified, no person to be delineated. Rather there is a living, vibrant, ineffable consciousness which has the particular characteristic of spontaneously, joyfully, irreducibly, creating multiplicity from unity and – at least within human consciousness – of creating unity from multiplicity. Whether the style of that unified form is realistic, symbolic or abstract begs the question. The 21st century art world has historians scrambling to find an “ism” for the art world of today. There is no definitive style. Anything goes. What’s up for the future is anyone’s guess. Yet for the 21st century artist, if, after tossing realism out the window as passé and spending decades analyzing the symbolic content of their own internal dream-world, or alternatively sitting on a mountain peak in meditative abstraction, if then there is not a humbled, yet enlightened return to the daily marketplace of non-dualistic realism, I’d personally be surprised. As human beings we exist in an integrated way within all three states of consciousness. As such, they inform and interpenetrate one another. Deprivation of any one for a length of time produces an unhealthy imbalance. So, I’m betting on an integrated approach to creativity, one in which the realistic, symbolic and abstract levels of the visual vocabulary will all be transparently operating. What will that look like? Who knows, but won’t it be fun to find out? And isn’t that simply one way to look at what is already happening, swirling all around us? An interesting series of events occurred in mid-nineteenth century France: Lecoq’s discovery of a systematic way to develop (human) visual memory to a high degree of accuracy followed perhaps ten years after the French Academy of Sciences recognized the patent application of Louis Daguerre and his Daguerreotype. Surely Lecoq was not unaware of the early stirrings of photography, it would have been blasted over the newspapers and fully discussed in the cultural circles of his time. What is interesting rather, is to consider why it seems his discovery received the little recognition that it did – both then and now. One possible reason could be the explosion of Impressionism: one year after the 1862 publication of Lecoq’s revised edition of L’Education de la mémoire pittoresque was the famous 1863 Salon des Refusés, which marked the beginnings of Impressionism. It’s readily acknowledged historically that the advent of photography provided the impetus for Impressionism and the art forms which it engendered: Neo-Impressionism, Post-Impressionism, Fauvism, Cubism, Surrealism, Da-Da, Expressionism, Pop-Art, Hard-Edge, Color Field, Minimalism, Symbolism, etc… all moving further and further afield from a realistic rendering of external reality and towards an abstract vision of an inner, subjective reality (whatever it may be, using whatever means may be available, which may or may not have any relationship to the external world). I humbly submit that by losing (through devaluation) the various tools and techniques which artists have used for centuries for rendering personally significant reactions to the external world in and around themselves humanity has lost an essential relationship. An essential mirror of itself. I would not argue against abstraction, and conversely, I would not argue for realism, as both languages can be exceptionally powerful or exceptionally vapid, depending upon their spokesperson, but I would argue for integration. The physical absorbed into the metaphysical; the metaphysical rendered meaningful through the physical. In this powerful inner dialog (which essentially comprises a human life), experiential memory plays an essential role. Kinda exciting to consider that, isn’t it? 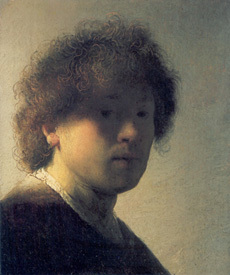 An excerpt from the book: Painting in reference to the raw materials and the role of technique in the creation of art by Nicolas Wacker. Published by Editions Allia, Paris, France. Translated by Ellen Trezevant. “All spiritual creation is dependent on its material. Without it, no transmission would be possible. The mystery of art lies in this collaboration between the material with the spiritual. For it is through that, and that alone that communication can be passed. How and at what moment does matter become spirit? These words of Wacker resonate so well with my own temperament that I hesitate to add anything of my own. Yet since they were originally spoken about fifty years ago, the sentiment bears a fresh look. The contemporary art world now seems to function in a no-holds-barred vacuum. All forms of expression can be called “art” if they are somehow art: realism, superrealism, photorealism, abstraction, expressionism, naieve, primitive, conceptual, assemblage, installation, video, etc… What is it that makes the world pronounce the word: ART? Although the question is rhetorical and cannot be answered in words, for the artist, the magic really happens when the materials they cherish, investigate and use finally resonate to their own inner vibratory truth – whatever that truth may be. And the closer each individual artist’s truth is to that of the inner truth of humanity – well the greater the chances are that someone, somewhere will call it ART. Otherwise, there are fads and fashions that will go in and out of style. My two cents.